These amazing anklets use a patented technology which is exclusive to Pretty Polly. Their Sweet Steps range is extensive and is based on a nano-porous material that traps odour molecules as they pass through the material. 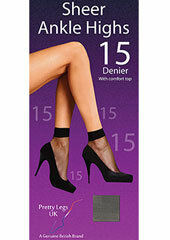 This guarantees to significantly reduce foot odour, keeping your feet sweet and fresh all day. The lightweight patch is fused to the sole of the ankle high and will last for the lifetime of the garment, it also safe for your skin as well as kind to the environment.